The ship Exmouth, captained by Isaac Booth of Sunderland, left Londonderry bound for Quebec on the morning of Sunday 25th April 1847. The exact number of passengers has never been accurately established. Though the vessel was registered to carry 165 and a half people (two children counted as one adult) it is believed that the actual number on board exceeded 240. These were almost exclusively emigrants fleeing the Irish famine and seeking a better life in Canada. Late on the same afternoon a changing wind brought an unexpected gale which raged for the next two days causing worrying damage to the ship's rigging. By late on Tuesday afternoon all bearings had been lost and the ship was desperately in need of repairs. Finally, just before midnight on the Tuesday, a light was seen to the starboard. Believing it to be the light of Tory Island, the mate was ordered to heave for it. Tragically, it was in fact the new floating light of Orsay, some 100 miles away from Captain Booth's reckoning. Two hours later the ship struck rocks just south of Ghille Mhore on the Sanaig coast. Three of the crew managed to scramble along the rigging and onto some rocks where they sheltered throughout the rest of the night. Daylight enabled them to see a route onto the mainland from where they made their way to a farm and raised the alarm. Altogether 108 bodies were recovered and buried in the turf above Traigh Bhan, about half a mile from the site of the actual wreck. A monument to the tragedy was unveiled in June 2000. 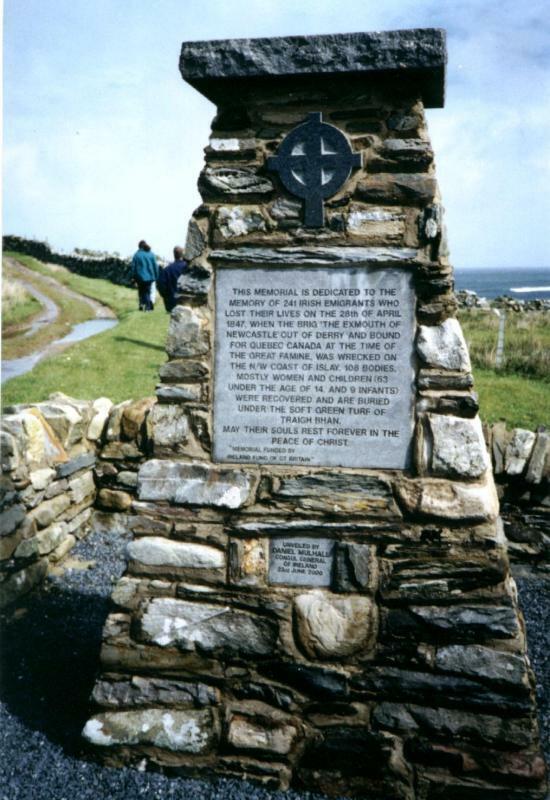 The monument lies at GR 236707 close to the village of Sanaigmore on western Islay.